For "light particles," or photons, this should also work. Unfortunately, this idea faces a fundamental problem. When photons are "cooled down," they disappear. Until a few months ago, it seemed impossible to cool light while concentrating it at the same time. The Bonn physicists Jan Klärs, Julian Schmitt, Dr. Frank Vewinger, and Professor Dr. Martin Weitz have, however, succeeded in doing this  a minor sensation. When the tungsten filament of a light bulb is heated, it starts glowing  first red, then yellow, and finally bluish. Thus, each color of the light can be assigned a "formation temperature." Blue light is warmer than red light, but tungsten glows differently than iron, for example. This is why physicists calibrate color temperature based on a theoretical model object, a so-called black body. If this body were heated to a temperature of 5,500 centigrade, it would have about the same color as sunlight at noon. In other words: noon light has a temperature of 5,500 degrees Celsius or not quite 5,800 Kelvin (the Kelvin scale does not know any negative values; instead, it starts at absolute zero or -273 centigrade; consequently, Kelvin values are always 273 degrees higher than the corresponding Celsius values). This photonic Bose-Einstein condensate is a completely new source of light that has characteristics resembling lasers. But compared to lasers, they have a decisive advantage, "We are currently not capable of producing lasers that generate very short-wave light  i.e. in the UV or X-ray range," explained Jan Klärs. "With a photonic Bose-Einstein condensate this should, however, be possible." This prospect should primarily please chip designers. They use laser light for etching logic circuits into their semiconductor materials. How fine these structures can be is limited by the wavelength of the light, among other factors. Long-wavelength lasers are less well suited to precision work than short-wavelength ones  it is as if you tried to sign a letter with a paintbrush. It's disputable, whether the light is propagating through atoms more in form of photons and/or plasmons i.e. surface waves of electron orbitals. 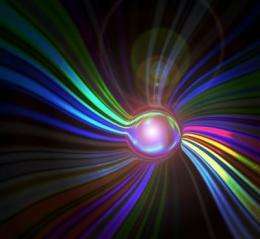 The formation of squeezed and/or superfluid light was observed recently with another research groups. This sounds exactly like a laser. Is the light frequency limited to the pigment emission wavelength? If so it will not be a path to get a coherent intense XRay. Im not quite picturing this. They got the photons to freeze in place? "During this process, the photons assumed the temperature of the fluid," explained Professor Weitz. "They cooled each other off to room temperature this way, and they did it without getting lost in the process." I'm trying to get a sense of what's going on here, but I'm drawing a blank. Is there anyone here who could enlighten me as to what is meant by the 'temperature' of a photon? From my physics courses, I was left with the sense that temperature is more or less defined as the average ambient vibrational kinetic energy of matter in a localized space. How does this apply to photons, and what does it mean? Photons have a wavelength, yes (as do 'particles' of matter, though it's very hard to detect.. and this is the best hint at an answer that I have).. and that wavelength should be expected to be longer if the body that gave it off is cold.. but is does this 'temperature' arise from an independent property of which I'm unaware? I'm going to guess that he's just referring to a distribution of photons which corresponds with the a black body radiation curve of a cool object. I hadn't thought of it before, but I suppose that perhaps up until now, there hasn't really been a technology that concentrates a large amount of long wavelength photons in a small space for a prolonged period of time. I find it a bit strange that they try to cool photons DOWN, while "cold" photons have less energy, corresponding to a longer wavelength. So cooling down will not get you to X-ray wavelength, but towards radio wavelengths (of course it depends on which wavelength you start out with, but if you can cool down to visible light, you can also cool down to X-ray). Nonetheless, the feat to make a BE condensate from light is pretty cool. "We are currently not capable of producing lasers that generate very short-wave light – i.e. in the UV or X-ray range,"
Am I misreading this? I worked with excimer lasers in college in the 1970's. There are several types of x-ray lasers including free-electron lasers(FELs). Some of these short wavelength lasers have been used for biomedical, medical(LASIK), and industrial purposes for some time. A foton relativing harder as h-boson (betweensise) of the cosmic sound, only the l-boson (aroundtale) is to see on the picture thats softs the unrelative light. Mean, ray is a fictional Y because 'of' the scientifical X.
it has nothing do with wavelenght). Now You can see what is temperature of photon. Its basically the temperature of Photon Gas.Now when you bring them closer at low temperature they will behave like Helium(boson) bose einstein condensate. and that wavelength should be expected to be longer if the body that gave it off is cold.. but is does this 'temperature' arise from an independent property of which I'm unaware? Temperature of light is determined by wavelength, primarily intensity. So when they say the "temperature" of a photon, they're referring to the amount of energy contained in the photon. Cooling a photon is removing energy from the photon. Expressed in Kelvin, longer wavelengths due to lower energy== cooling photon. Because the lower the energy of a photon, the more rapidly that energy will disappate into the background environment. Lets take Photon as a gas and apply PV=nRT.T=PV/nR. (as you mensioned ,temperature is always an average phenomenon, it has nothing do with wavelength). I'm preferring the wavelength interpretation, since that most directly describes the energy of the photon and I now think it can work well enough. However, thinking of pV=nRT is interesting anyway. Though photons do not appear to interact with one another in the way that the particles in a gas would, they can transfer momentum to the matter of the containing walls.. and I believe this momentum is inversely proportional to the wavelength. So perhaps the interpretations aren't entirely different anyway. Something is completely messed up here. If temperature of a photon is its wavelength then cooling it mean making this length longer. Infrared is long wavelength light, not X ray that is extremely short wavelength (hot) light!! Also, long wavelength light is not hard do generate at all, all radio stations do it with ease. Laser working in this diapason is called Maser. But if the interpretation of temperature was something else here the long introduction about black body do not make sense, it is exactly about wavelength. The pigment between mirrors that is exited is also the working principle of usual laser. In the world of abstract communication, information becomes more of a play on words that if attuned to, can convey meaningful insights on the subject at hand. From a Macro scale perspective, terminology does not directly apply to Micro scale physics; Such as the term temperature describing the state of a photon. However it can help describe or develop a new perspective. The researchers claim that by concentrating a sufficient number of the photons in a compact space, (of fluid containing dissolved pigment molecules which absorbed and emit photons from a laser), allowed the photons to condense into a super-photon behaving like a single huge super particle. It appears that the cooling lingo is simply the result of lowering the energy of the photons by the absorption and emitting of the pigment molecules. What's interesting is the possibility of making a space craft behave like a photon!!! Not to be a 'wit', but seems as if Herr Einstein and his religion of 'c' is starting to get a bit shakier once we start considering light as matter more and more in this way.....like the idea of a large macroscopic object as a 'photon'. This is supposed to be always the mythical 'c' which is starting to look like the terminal velocity of matter in non-empty extra-planetary space as comparable to the terminal velocity of falling ordinary objects in the atmosphere. Both from friction and maybe both calculable using various fluid drag coefficients. This would render transphotonic velocities vulnerable to fluid dynamics of an energy field nature. Of course, the concept of boson condensate violates the concept of massless photons, which will penetrate mutually like ghosts. Can such experiments serve as a tangible evidence, photon is material particle, which doesn't transfer just a momentum, but a mass too, after then? Actually not. In the dye medium, the transversal decay is of subpicosecond timescale. The distance traveled by light in one ps is 0.23 mm, which is still pretty large distance in comparison to distance between molecules of dye. It can serve as an evidence, the EM field is mediated in plasmons (i.e. surface waves of charge density along surfaces of atom orbitals) through dye, not via normal photons. You may want to repeat these experiments with "photons" in vacuum - and you would see the difference immediately. So no - whereas I can argument the concept of material photons easily, these experiments cannot serve as a conclusive evidence for it, because matter of environment remains involved in them. We can compare these plasmons to bosons, which are mediating nuclear forces inside of atom nuclei - they appear real and massive (they can even form a glueballs, i.e. analogy of "super-bosons") - but they cannot survive outside of atom nuclei. I do believe, the true super-photons can exist and they were even observed in nature like gamma ray bursts of photons, which can propagate collectively at the large distance - but to create them in terrestrial conditions would require a much larger effort. Photons aren't massless. They simply have no rest mass. There's a difference, and it is an important one. First, Maxwell determined c, yes. If it turns out that photons go less than c by having mass, Relativity would not be effected, as c would still be an intrinsic upper limit, just not matching the photon velocity,... there would still exist "gravitational" waves, waves of space-time distortions. Relativity actually doesn't recognize photon concept at all, so it can define just the speed of plain waves. Photons are concepts of quantum mechanics, and relativity has nothing to say about it. BE-C does not imply photon mass. LOL, it's just you, who just explained here, why the photon should have mass, if it turns out that photons go less than c. How do you know by now, photons are moving with speed of light exactly? Did we ever measure it? It would, if BE-C would be formed with photons. Which isn't, in the particular case of article disputed. The main trick is in the point, relativity is strictly 4D theory. It considers space a flat 3D analogy of water surface, where only transverse waves are spreading. But due the vacuum fluctuations every wave propagates in clusters - i.e. photons - which are doing "jumps": they're moving slowly for a while - and after then they "evaporate" and re-appear at the quite substantial distance from original place via quantum tunneling. Actually it's nothing, which couldn't be observed at the water surface deformed with Brownian noise. Quantum field theory interprets the same phenomena with temporal formation of particle-antiparticle pairs, which are materializing and annihilating alternatively along path of light. The superluminal speed of photon tunneling can be actually observed during tunneling of photons between prisms (Hartman, Enders, Nimtz..). The material character of photons can be illustrated with their own gravity field, which keeps the gamma ray bursts together at large distance. Photons are not beleived to have mass, though some epiphenomenon may show as 'effective phone mass'. Have you done an experiment showing photon mass? BTW Lightweight particles like the neutrinos are doing the very same: they just don't evaporate completely, but they change their color, which is known as a neutrino oscillation. The kaons and other mesons exhibit the oscillations, when they're propagating through dense environment of atom nuclei, where they appear like massless particles in similar way, like photons in vacuum. And the plasmons formed inside of dye solutions are doing the very same: they're propagating like excited atoms or like pure photons alternatively, thus doing the very same "jumps", like the photons in vacuum. It's quite easy to imagine it. The experiment showing photon mass has been done by shining of gamma ray photons to atom nuclei. At the proper wavelength such photon can bounce inside of nuclei like wave trapped into glass sphere and you can compare the mass of excited atom nuclei with these normal ones in mass spectrometer. but "effective photon mass" != "photons have mass", right? The rest mass of photons is complex problem. The most lightweight photon has the wavelength, which would fit into whole observable Universe - such wavelength would correspond the mass 10E-61 kg or so. Such photon cannot exist because of decoherence. Even much smaller & more massive photons of CMBR are effectively behaving like massless ones, because they're swimming in ocean of another photons of the same rest mass. But the smaller photons (i.e. those of wavelength smaller then the ~ 2mm) should behave like massive particles with positive zero mass. The larger photons would be tachyons with negative rest mass instead - they would disperse in CMBR field less or more rapidly. Try thinking of Space and Matter as two opposite manifestations of one Energy. At one end of the spectrum you have matter (a photon of light) moving through space and at the other end of the spectrum you have space moving through matter (a Black Hole). Now, in the middle of the spectrum you have the buoyancy of these two manifestations (Space and Matter) as electrons, beta, gamma etc. The ideal here with the Space-Mass Spectrum is that each quantum of mass interacts with a gradient of space that is equal in energy and is an integral to the constant C (the speed of light). These gradients of space are known as fields and are what makes up space like the colors of a rainbow make up the white light, metaphorically speaking. Some of these gradients or fields are known as the electric field, magnetic field, gravity field, strong force, weak force, etc. This article makes no sense whatsoever. 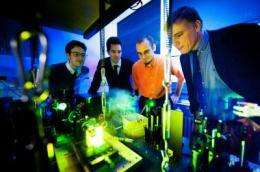 First regular lasers already produce a state of light which can be though of as Bose-Einstein condensation of photons. Second the whole talk about photon temperature makes little sense, if you "cool" visible light photons you will end up with infrared or if you keep "cooling" radio-frequency photons. How the hell is that supposed to result in x-ray lasers? Whatever the original result might be it was certainly lost in this attempt to popularize it. Certainly not enough info given to understand what is going on. If it is possible to create a BEC of photons, would it be possible that upon its collapse, all the energy is emitted as a few coherent high energy photons? Maybe subsequently but not as a result of being a component within a BEC. BEC states are merely a congruence of wave form, not a joining of wave form. You're right, but the same effect, which leads to first and second order optical effects in lasers will lead to the autofocusation of light up to level, an analogy of clouds of atoms, glueballs or photonballs in gamma ray flashes will be created - i.e. a spatially constrained ball of plasmons within matherial. Under this situation, the density of photon condensate is independent to the size of resonator - the bosons are held together with their own forces, not by bouncing of/reflection from resonator mirrors. To convince themselves that the peak is related to a BEC, rather than the cavity behaving like a laser, the researchers repeated the experiment at several different separation distances. They found that the peak always emerged at the same photon density - something that would not be seen in a laser.